"Final..." You keep using that word. I do not think it means what you think it means. Coming in 2015 as part of its Final Fantasy lineup, Square Enix has announced 2 new Final Fantasy games and a new app. 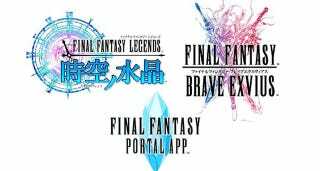 Famitsu App reports that Final Fantasy Legends – Crystal of Time and Final Fantasy Brave Exvius, as well as a new Final Fantasy Portal App for managing mobile Final Fantasy related games and info will be coming to the iOS and Android platforms. In a world divided into East and West by the folly of Man, the Eastern land of Ajima and Western land of Westa have been in unending conflict. On the island of Nabaru, located between the two warring lands, the young boy, Toumoro begins an adventure through time when he meets a young girl from the future, Emo (pronounced, "eh-mo"). Together, the two begin a journey through the present, past, future, and a mystic world out of time to save the world from a dark future. The game is slated as a "time-traveling RPG" and features command-based combat that fans of the Final Fantasy series are familiar with. The game will be free-to-play with payable elements, and is scheduled for release this Winter. A collaboration between Square Enix and popular mobile game, Brave Frontier developer, Alim. Brave Exvius is an all new crystal story. Very little information has been released other than game screens and the 3 primary characters, the hero, Rein, his rival Raswell, and the heroine, Fiina. Battle screens also show characters from previous Final Fantasy games fighting alongside the protagonists. Final Fantasy Brave Exvius is scheduled for release this Winter and will be free-to-play with payable elements. A tool for news about Final Fantasy related games, books, music, goods, and events. Users can log in with a Square Enix ID to earn points to trade in for digital content and the chance to win various paraphernalia. The app will also include the Triple Triad card game from Final Fantasy VIII as one of its features. The Final Fantasy Portal App is scheduled for release this Winter. The app will be free to download with some for-pay content.